Two months ago, one of the websites we manage was hit by a wave of Distributed Denial of Service attacks, each with a changing attack vector as the systems mitigated the attacks. These started with basic UDP floods, moved through some NTP and DNS reflections and the only remaining attack which was effective was a layer 7 attack on the site directly. This final, layer 7 attack was a WordPress Pingback attack. While it initially took the site down, we were able to mitigate quickly and see the full force of what the attack was. 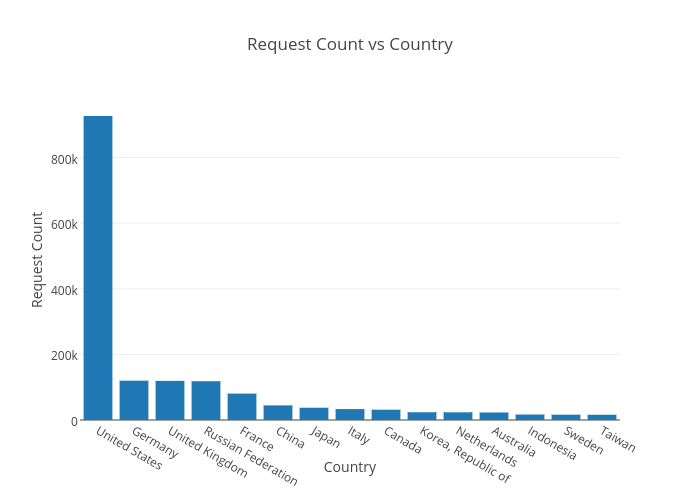 2.2 million requests in 15 minutes, which peaked at 4,500 requests per second. This is a lot of traffic for a site which previously averaged around 20,000 requests a day and while it’s low in terms of global DDOS attacks, it was still a significant issue for the destination content management system (not WordPress). Unfortunately, out of the box WordPress has one component which can be exploited for malicious use. By default, the pingback (which allows you to record who linked to your blog) doesn’t have any form of validation to ensure the “pingback” was from the requesting server. This means that a request can be made against a fully patched, clean server and the return request will go to your intended target. The request from the attacker only needs to be a simple script or even a cURL based call, which is trivial to do. This will still leave the remaining XML-RPC code functional, but prevent your site from being used in a pingback dos attack. Chances are, if you don't know what a pingback is then you probably don't need it. As we hadn’t disabled logging for this code block, all requests were still logged and it gives us the opportunity to analyse the data further. Ideally of course we’d tweak a rule within our Web Application Firewall (WAF) to detect and rate limit requests, however being time sensitive this was the fastest approach to bring the site back online. To run through the data, we used our Elastic stack so that we could use a high speed index to manipulate. If you haven’t tried the Elasticsearch / Kibana combo for log analysis, I highly recommend looking at it sooner rather than later. It’s absolutely invaluable when it comes to analysing patterns and being able to perform further analysis. The distributed nature of nearly 10,000 sites making the calls means it’s impossible to block via IP. This is why attackers favour a distributed attacks, as the blocks from both the originating ASN and the destination aren’t feasible to do manually. Especially since the pingback is a layer 7 attack, this means any DDOS scrubbing service needs to be intelligent to block proactively. 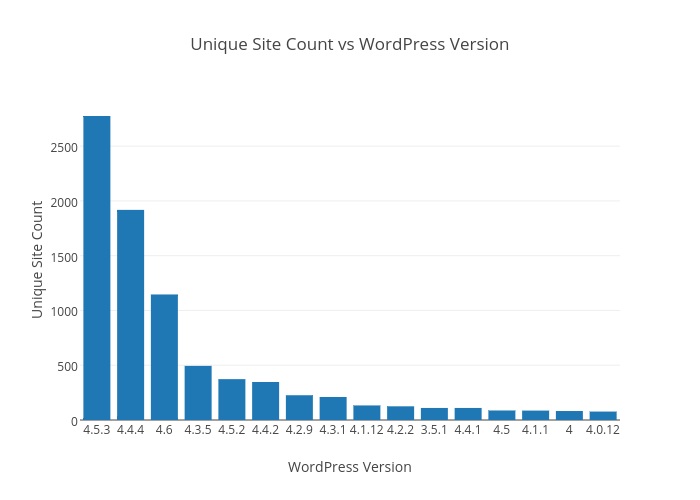 The number of WordPress versions seemed abnormally high, which upon investigation showed that many seemed to be obfuscating their version. I’m not aware of any plugins which obfuscate the version numbers like this, however over 1,400 sites had version numbers which didn’t match a standard WordPress pattern. I manually checked around a dozen sites to see if they were simply faking being WordPress based and all were legitimately running WordPress. If anyone knows the reason for this, please let me know in the comments below! Even this is fairly high, considering how easy WordPress makes it to update your software I was hoping to see less of a spread. If we look closer at the remaining versions, there’s some scary stats. The oldest version is 2.8.1, which was released back in 2009! Thankfully this was only one hit and one manually verified out of disbelief (it really was that old). As a percentage overall, sites running 4.5.3 were 26% of overall sites and only 11% of sites were running the latest 4.6 release (the latest when the data was gathered). The official WordPress stats (https://wordpress.org/about/stats/) show more sites which have updated (thankfully), but it’d be nice to see a much lower spread in the future. 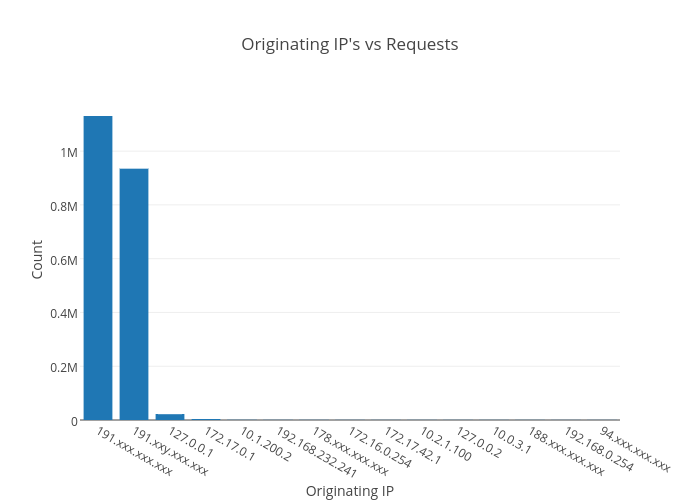 Being an Australian based hosting company, we were interested in seeing where the pingbacks originated from and performed a geo-ip lookup of the requesting server's IP address. The spread remains roughly the same. Given that a significant amount of cloud services and hosting companies are based in the USA, this figure doesn’t seem out of place. 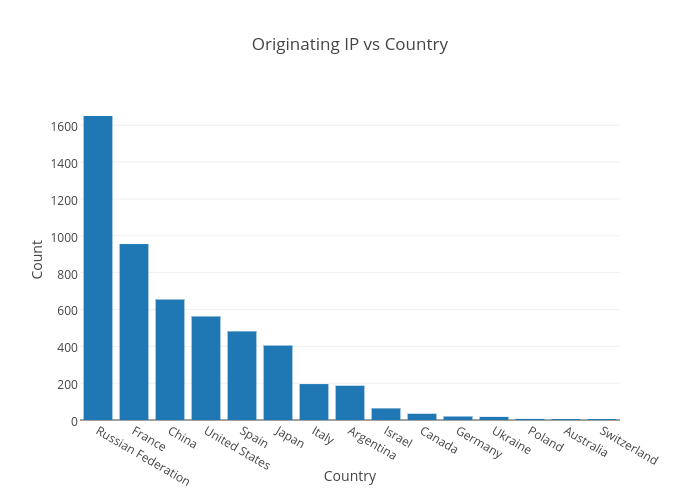 This plot shows that the majority of the botnet / originating IP's came from Russia. I'm not sure if other attack analyses have found any correlation between where the botnets are located and where the attack originated from, but there's no way to tell from the data we have. It could be that the random IP selection of the bot has some predisposition to certain IP ranges, which I have seen before in other attacks. Either way, it does highlight how much of a global problem DDOS attacks are and the difficulties surrounding the ability to close associated botnets down. The pingback tool within WordPress still remains an exploitable system for any WordPress site which hasn’t explicitly stopped it. From a web host’s perspective, this is quite frustrating. With enhanced firewall rules in our system, we’re now logging around 2.5 million malicious pingback requests per month (inbound). In world hosting terms we’re only a small player too, no doubt the larger providers are seeing pingbacks in the hundreds of millions or more per month. There’s two immediate changes WordPress could make to resolve the issue going forward. The first is to disable pingback by default. Those who require it would still be able to easily enable it. Chances are if you don’t know about it, then you probably don’t require it anyway. This would still leave those sites vulnerable to being used in attacks, so it's only reducing the number of potential sites which can be used. The second method is to consider the use of a third party system (such as Jetpack) to handle pingback requests as the default. It’s far easier for a centralised platform to be able to detect abnormal behaviour and implement basic rate limiting / blacklisting of bad requests. This is no different to their default installation of the Akismet plugin for spam handling, so it would be a sensible option for WordPress to adopt going forward. With WordPress 4.7 just around the corner featuring a big upgrade to the REST API, we’re hoping that this is the catalyst to consider disabling XML-RPC by default. Those who still require it could still re-enable it, but it would at least reduce the amount of potential sites hackers can use for malicious use. At the end of the day we still absolutely love and recommend WordPress, especially since features such as the auto-updates are invaluable to patching security issues. If a few of the legacy issues like the pingback vulnerability are resolved then it'll simply be even better.